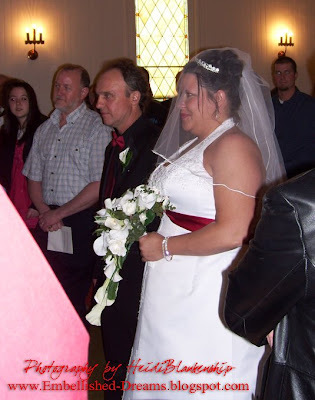 This past Sunday was mine and my husband's wedding anniversary. I wanted to make him a card for our anniversary and I got to thinking that he has seen all of my 'guy' stamps, so I wasn't sure what to do. So I had to do some thinking on that one! I also wanted the card to be special-something just for him. Eric collects dragons like the ones from the Bradford Exchange and I thought it would be really fun to make him a card with a dragon. 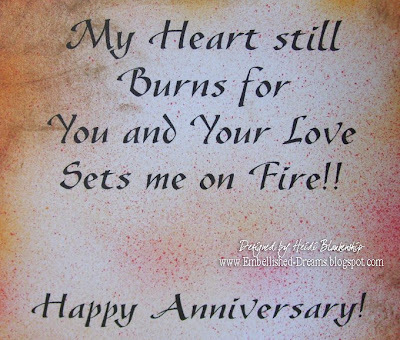 I know not your typical anniversary card! My next thought was how do you make a card with a dragon and still find the romance? Well here is what I came up with.~ I found the picture of the dragon and printed it out. Then I covered it with micro beads and added some rhinestones for some bling! I had a pattern for flames and I did some airbrushing with the Copic markers and the ABS to add the colors. Then cut out the flames and outlined them using the black Spica glitter pen. I also added a little hardware and ribbon along with the sentiment. Now for the inside of the card. Here is where the 'romance' comes in! lol!! I put a poem on the left side and another sentiment on the right. I also did a little more airbrushing on the inside of the card. I am happy to say He LOVED it!! 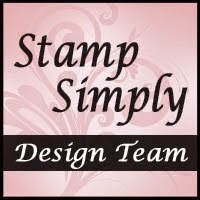 Stamps-No Stamps this time around! Everything was printed off the computer. Thanks so much for stopping by today!! I hope you enjoyed a different style of creativity! I hope you day is filled with sunshine!! 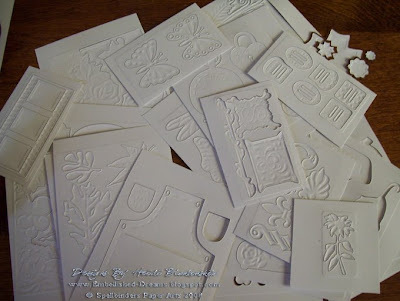 This past week I received a WONDERFUL package from Rubbernecker Stamp Company!! This is the first time I have ever used RN stamps and I have to say I LOVE them!! 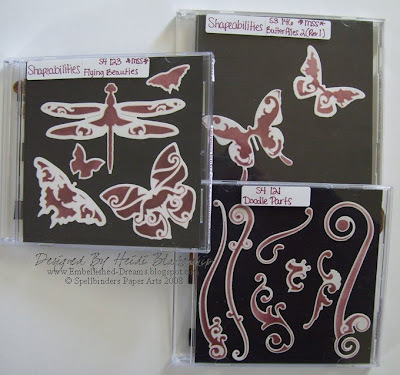 They are unmounted deeply etched Red Rubber with a cling back for mounting onto an acrylic block. The past few days have been kind of cold and rainy and I think I am trying to will spring here! My plan just might be working, it was in the 60's yesterday and today it is supposed to be in the 70's! 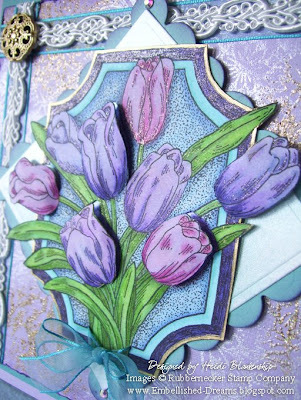 I thought this tulip image would be perfect for a spring card. When I worked at the floral shop I always looked forward to the tulips in the springtime. 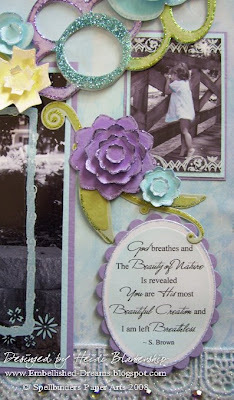 The background images are from a from a Floral Collage stamp. The stamp is a large background stamp but my CS was a little bigger than the stamp so I stamped it a couple of times to get complete coverage on the CS. I used versa mark ink and then lightly sprinkled on a little EP. Before heat setting the EP I also added some perfect pearls to add some shimmer. After heat setting the EP then I brushed off the excess perfect pearls. The tulip image was colored in using Copic sketch markers. I love being able to blend all of the colors together! To do the tulips I used several colors from the pinks and purples, starting with the lightest colors first and then going to the darker colors. I also added some touches of sparkle using the Spica glitter pens. Once I was done with the coloring I cut out the image. 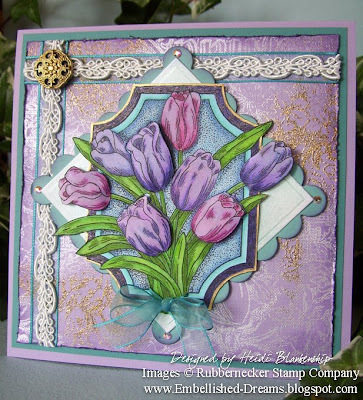 I cut out a Classic and Scalloped Square Nestabilities using the Wizard, Universal Die Cutting and Embossing Tool to mount the tulip image on. Before adhering the tulips I took a craft knife and cut around a few of the flowers and then popped them up with a little foam tape behind each one. When doing this you do not need to cut the flower out completely, just cut around it leaving it attached at the stem. Doing this takes a little more time but it really adds a lot of dimension to your image! Before adhering all of pieces together I also add the sheer ribbon and trim. 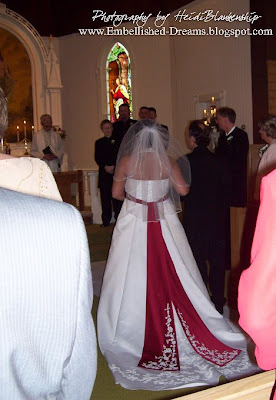 To add the sheer ribbon I used a tape runner and for the trim I used Fabri-tac. Fabri-tac is great for adding trims and lace. If you don't want to wrap the trim underneath and have the extra thickness cut off the trim right next to the edge of the CS and add just a little dab of Fabri-tac. 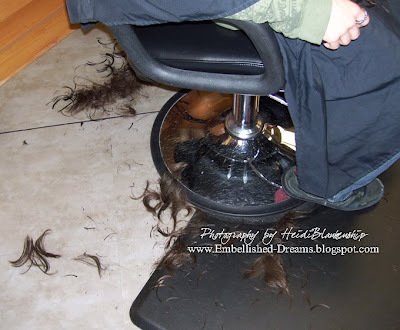 Doing this will hold the ends in place and keep it from fraying. Of coarse I had to add a few touches of bling! I added a vintage style button to the trim and some swarovski crystals on the nestabilities. Thank you so much for stopping by today!! I hope you have a wonderful beginning to a new week and don't forget to hop on over to Rubbernecker Stamps and check out all of the great products they have to offer!! Also right now they have a Spring Madness Overstock Sale going on with lots of great deals so be sure to check it out!! 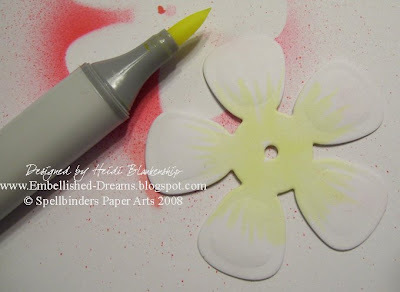 I want to share with you how I created the three dimensional flowers that were on a wedding card from the last post. 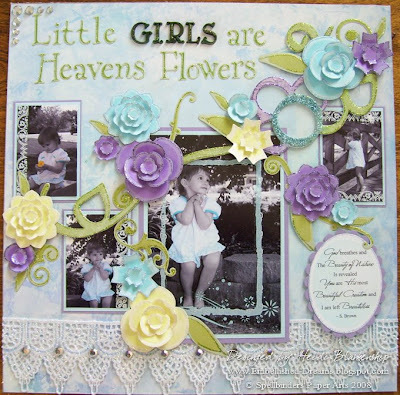 To create each flower I used three of the large flower shapes from the Spellbinders Flower Creation die and the Wizard Die Cutting and Embossing Tool. 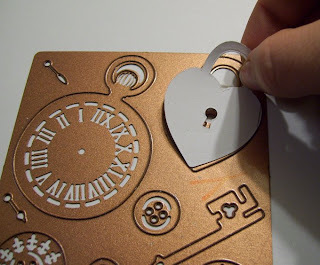 If you don't have this die you could also use punches, pre-made die cuts, or cut flowers freehand. As you can see in the picture I started out with white cardstock. All of the coloring for these flowers was done using the Copic sketch markers and the Copic ABS (air brush system). I started with the lightest color first, Barium Yellow (Y00). Start at the center of the flower using the brush tip, to do these strokes I lightly push down on the marker and pull up as I am coming out to the petal. For step two I did the same thing using a darker color, Chrome Orange (YR04). This was also done with a darker color, Cadmium Red (R27). I know this might seem like you are doing the same thing over and over and just covering up the lighter color with no results or maybe you are thinking why not just put the darker color on instead of doing all of these layers. But the great thing about working with the Copic markers is they blend and layering several colors will give you depth in you project. 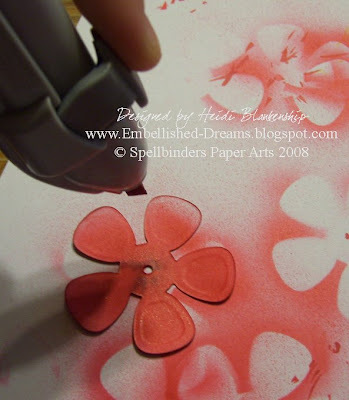 Using the same color as in step #3 lightly air brush over the entire flower. 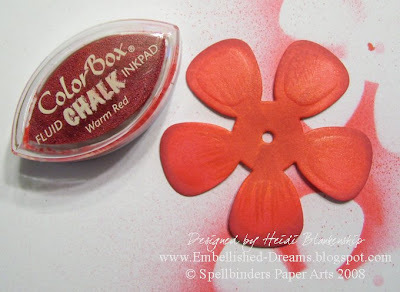 Using the Warm Red ColorBox ink and a sponge in all the edges of the petals. I wanted to use a slightly darker color to add more depth to the flowers. Using the Colorless Blender (0) and doing the same stroke as in step # 1 I pulled some of the color from the petals. Doing this lightens it up a tad and it also makes the faux veins of the flower show up more. This is the darkest color and the last color that will be added to the flowers, Lipstick Red (R29). Starting all the way in the center of the flower do the same stroke as in step #1 but do it with a slightly lighter hand. This will help to make finer lines. Since these flowers are three dimensional you can see the back side a little so I would recommend lightly airbrushing the back of each flower. After you have all of the flowers colored then you will layer them. Glue dots work great for doing this. 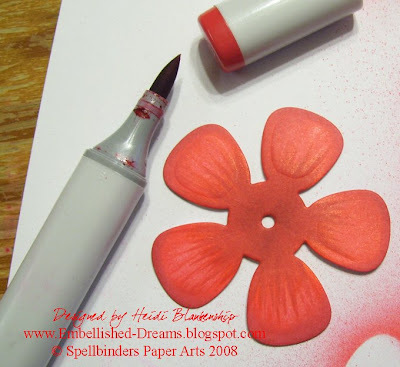 Make sure the petals are layered so you can see the petals on the bottom layers. 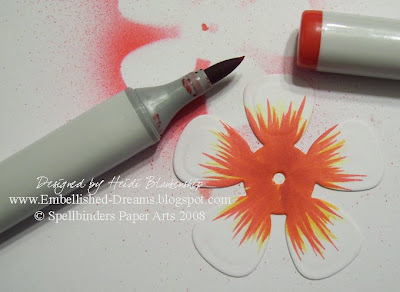 Once you have this done then bend (fold) the petals to the center of the flower. You can also use the end of a small paint brush to curl the ends a little. For the center of the flower I used a larger circle brad and covered it with dimensional pearl paint and then added a pearl flower. 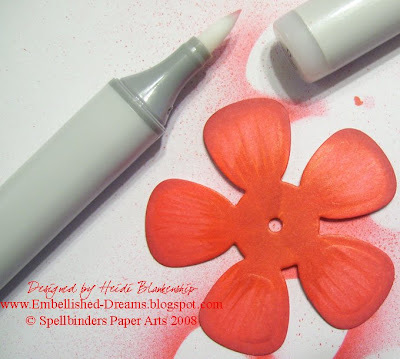 Here is a tip**If you would like to keep your flowers popped up put a tiny bit of clear silicone behind each petal. 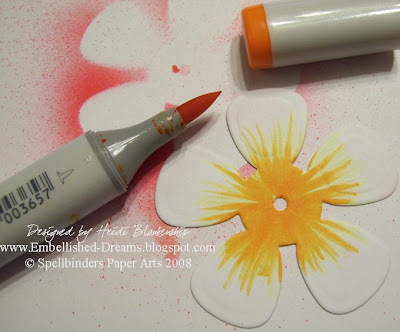 I hope you have enjoyed this tutorial with the Copic markers and doing the three dimensional flowers. I encourage you to give this a try!! If you do I would love to see your designs, so please leave a link to your blog or online gallery in the comments. Also if you have any questions please feel free to ask! Thanks so much for stopping by!! I hope you have a wonderful day and where ever you are I hope there is sunshine!! Ok, where to start! It was a busy weekend & I have a lot to share with you! This past weekend my cousin Lana got married!! They had a BEAUTIFUL wedding and I am so happy for Lana & Swanny (Jeff)!! 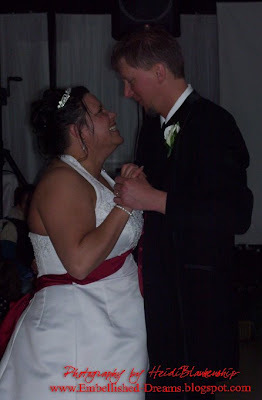 Here are some pictures from the wedding and the dance. This is the country church where I went when I was little. 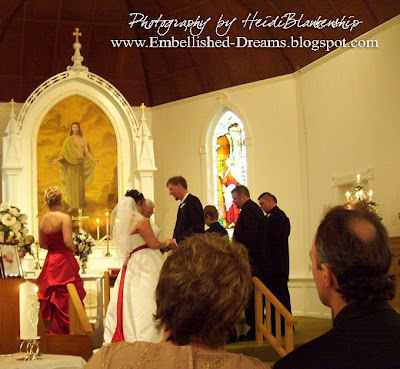 I have always loved the alter! 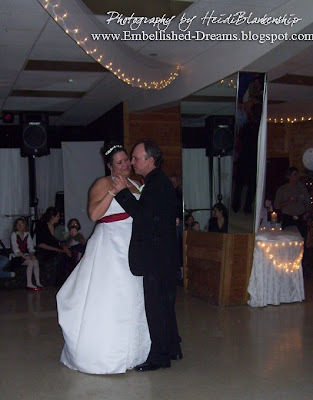 The First Dance~ Father and Daughter Dance~ It was a mix of emotions both happy and sad. I'm sure some of you remember me talking about baby Alex, Lana and Swanny are Alex's Mommy and Daddy and last June little Alex passed away. I know Lana and Swanny miss there little Angel Alex so much!! We all do!! My aunt, Lana's mom asked if I could paint something for out at the cemetery for Alex. She had a double heart with silk flowers and had a little saying she wanted painted on there. Here is a picture of what I painted. Lana and Swanny had no idea that I was doing this, it was a special surprise for them. I have to share this other little bit with you--After we got to the reception the maid of honor and the best man both talked and thanked everyone for coming. Amber who was Lana's maid of honor told us that she had been praying and praying that the sun would come out on Saturday, even if only for a little bit. It has been really cold here with a mix of rain and snow, but prayers were answered on Saturday afternoon!! Lana and Swanny wanted to go out to the cemetery to be with Alex just for a few minutes and as they were walking out there the sun came out and stayed out for about five minutes before going behind the clouds again. I don't think there was a dry eye in the place!! Alex was dancing with her Mommy and Daddy. I also have some creative inspiration to share with you! I made two wedding cards for Lana and Swanny, one from us and one for my Mom and Dad to give them. 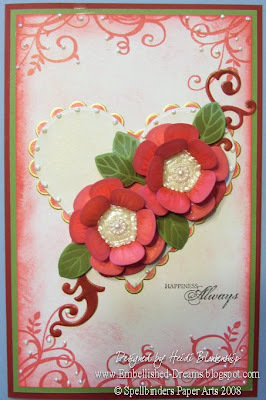 Here is the card that was from my Mom and Dad.~ The heart shapes are Spellbinders Heart Nestabilities (scalloped and classic) and the flowers were done using the Flower Creations die. I love making three dimensional flowers!! I also used the Copic ABS and Sketch Markers for coloring all of the die cuts. The flowers started out as just plain white CS. 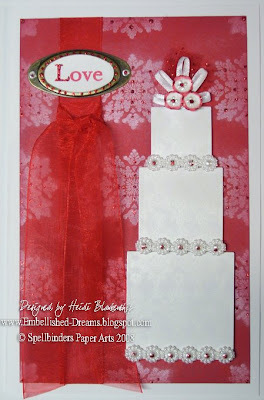 Here is the card that was from us.~ To make the cake I used the Spellbinders Square Nestabilities. 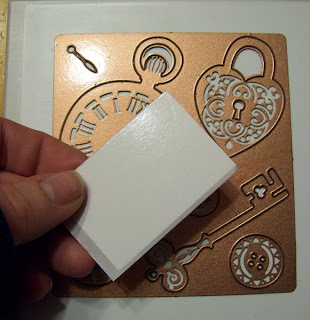 I also stamped a lace image on the squares using Brilliance-Moonlight White ink and added some pearl trim on the edges. For the topper I used a tiny piece of tulle and little loops of white satin ribbon along with three tiny flowers from the Flower Creations die. All of the stamps are from CTMH. For a little touch of bling I added some red stickles. 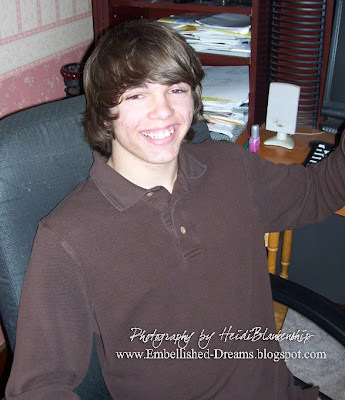 How many of you have a teenage son with longer hair? Do you wonder if they will ever cut it? I know I have thought that many times over the past few years!! Well Guess WHAT?? On Saturday totally out of tin air Dusty said he wanted a haircut!! I about fell over--REALLY!! 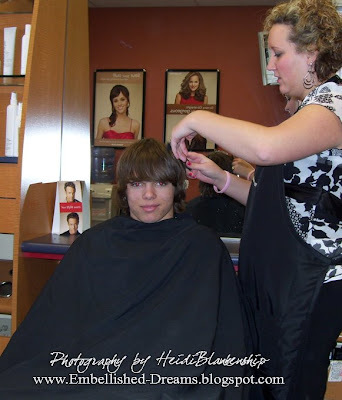 He has had longer hair for about four years!! I didn't know if he would actually go through with it or not but he did!! OMGosh LOOK at ALL that HAIR!! WOW LOOK at ME!! Thanks so much for stopping by today!! 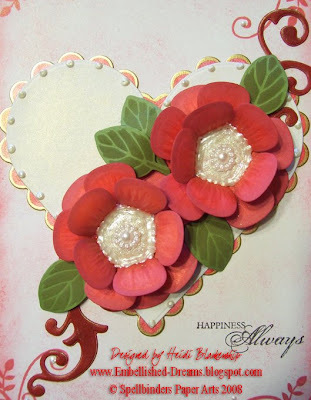 If you like the wedding card with the three dimensional flowers check back soon, I am going to do a tutorial on them. 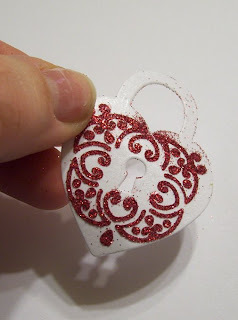 Do you love the sparkle glitter adds to your projects? If so you will LOVE this technique!! 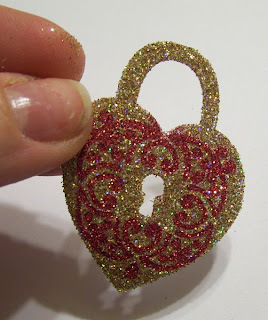 I am a total glitter junkie and one night while I was playing around with my Spellbinders dies I came up with a New Technique!! The Technique is called Adhesive Masking. I am very excited about this technique and would love to share it with all of you! I took a lot of pictures while I was doing this technique. 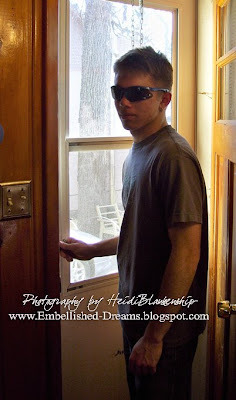 I don't know about you but I am a very visual person and I love to be able to see lots of pictures. 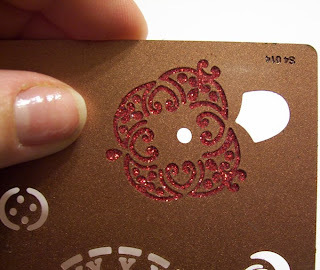 Spellbinders-Wizard Die Cutting and Embossing Tool or another die cutting system. 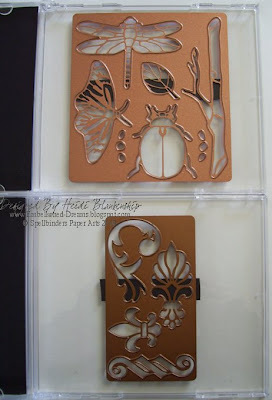 Spellbinders Dies-*this is an important note--Spellbinders dies are the only dies that are cut all the way through allowing you to also be able to use them as a stencil. Xyron-any size machine *don't worry if you don't have a xyron!! 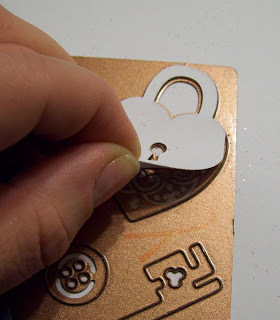 You can also use sticker paper or any kind of paper with an adhesive backing. 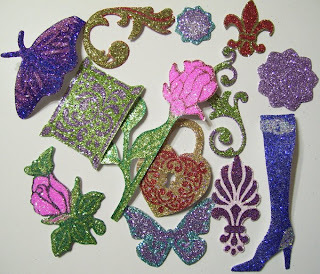 Assortment of Glitter-*ultra fine glitter works the best, it will get into all of the tiny spaces. As you are going through the steps you can also click on each image to enlarge if you would like to. 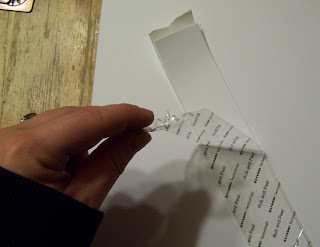 Remove the clear covering from the cardstock. 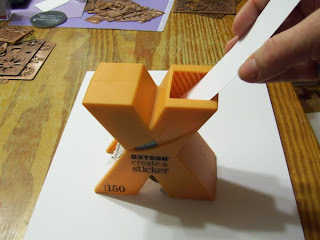 For placing your paper onto the die you want to make sure the side with the adhesive is down. If you used the xyron one side will be the cardstock and the other side will be the glossy paper with the adhesive from the xyron. Put the glossy side facing down onto the die. Layer the mats and run it through the Wizard. Peel off the backing to expose the adhesive. 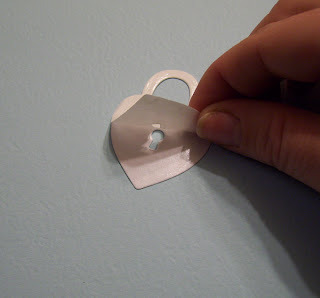 Once you have done this place the die cut back into the die with the adhesive facing down. 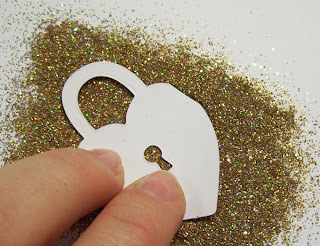 Now you will add your second color of glitter. This is what your finished piece will look like. Isn't that cool!! Here are a few other pieces I have done using the Adhesive Masking Technique. There are soooo many possibilities with the Adhesive Masking Technique!! I hope you have enjoyed the tutorial! I would love to hear what you think about the technique and if you give it a try please post a picture to your blog or a gallery and then leave me a link. I would love to see your creations!! I have received several emails from people asking how I store my Spellbinders dies. I know some people keep them in the containers they are sold in, others have filing systems and some keep them in various containers. I wanted to find a way for storing them so at a quick glance I could pick out the one I wanted. 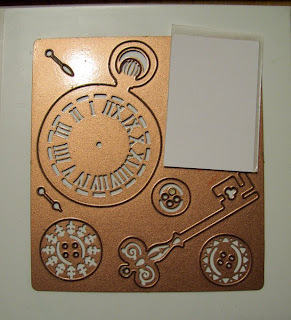 I also wanted to see an example of what the die cuts looked like once they were cut, embossed and stenciled. I decided to use CD cases to store the dies. Here is what I have come up with that works wonderfully for me. I get a pack of CD's from Walmart and take the guts out (the part that holds the CD), they snap out very easy. Then I add magnets with an adhesive backing which hold the dies in place. Like I said I also wanted to see the die cut so this is what I did for the front of the CD case. I cut a piece of black CS to fit on the inside of the case and then once I had all of the pieces cut, embossed and stenciled I glued them down to the black CS. I also added labels with the name and number of the dies. 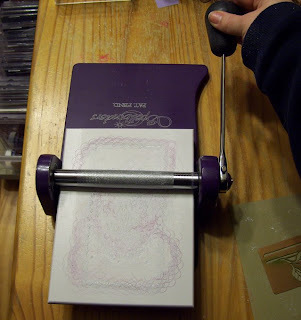 Another helpful thing I added to the label was MSS=Matching Stamp Set for the dies that have coordinating stamp sets. I know this can take a little time to do but it is well worth it! This might also be helpful if you decide to store your dies the same way. First cut and emboss everything leaving the CS inside the die like this---> Once you have everything cut then do your inking. This will save you so much time!! Here is how I store the CD cases. These container will hold 25 CS's very nicely and you can stack them. 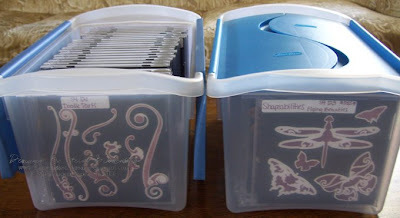 I hope this is helpful and has maybe given you some ideas for storing your Spellbinders dies. Thank you so much for stopping by!! I hope you have a wonderful Spring day and I hope you have some sunshine in your part of the world. 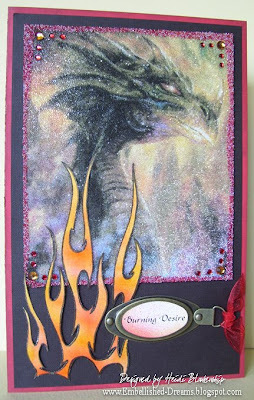 I am so happy I can share some of my Spellbinders DT projects with you! 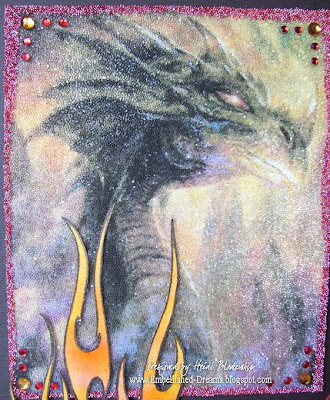 I want to start out by showing you my favorite piece that I designed for the Spellbinders Gallery. This is a LO that I did using some photographs of a friends daughter. My wonderful and longtime friend Kelli Dietrich is a photographer and when I seen these pictures of her daughter I fell in love with them and just knew I had to do a LO! 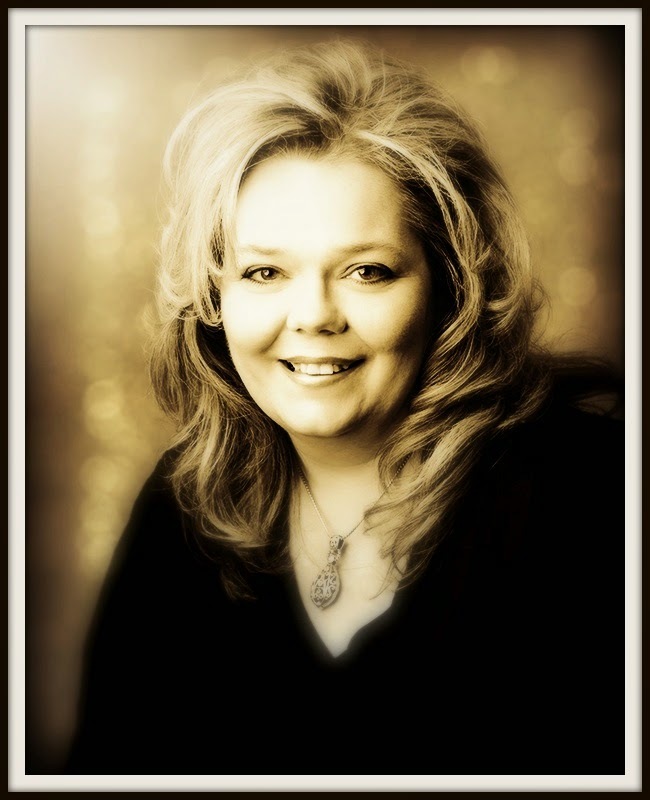 If you get a chance you should check out Kelli's website, God Inspired Photography. She has many beautiful pictures on her website!! To start out I used a piece of Designer Paper from Fancy Pants. It was a medium blue color but I wanted to soften it up just a bit and add a little white and lavender to it. First I used some Copic markers along with the ABS (airbrush system) to add some lavender colors. Then I took some Gesso and using an old gift card I swiped the gesso onto most of the paper going in all different directions. The gesso pulled up some of the color from the Copic markers and did a little blending on its own. After the paper was dry then I lightly added a little more color with the Copic markers and the ABS. 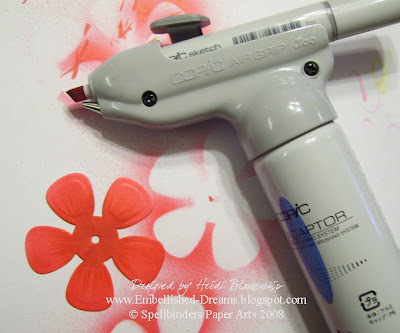 *Tip~If you haven't ever used gesso before you will want to know the drying time will depend on how thick you apply it. For something like the LO you want to apply it very thin. You can also sand gesso to get a more distressed look. Drying time for this piece was about 10 minutes. 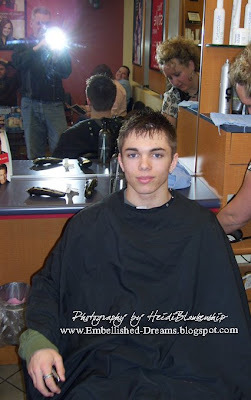 If you don't want to wait you can also use a blow dryer for faster drying time. 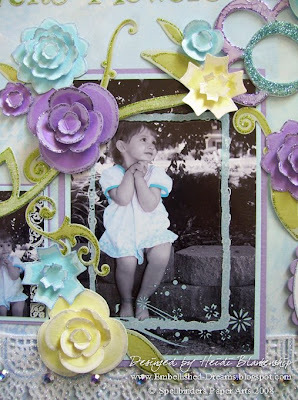 The flourish chipboard is from Fancy Pants. I used ColorBox Chalk inks and then covered the entire piece with Ranger Crackle Accents. When it was dry I went over the piece with a darker ink to further show the detail of the crackle. 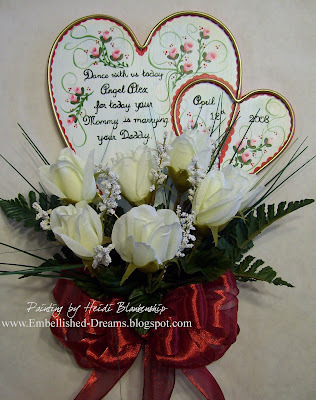 I used Spellbinders Wizard-Embossing and Die Cutting Tool and Spellbinders Flower Creations 3 die to make the dimensional flowers. I also added some doodles using the Doodle Parts die. The sentiment was printed out with the computer and then I used the Scallop and Classic Oval Nestabilities to cut and emboss. 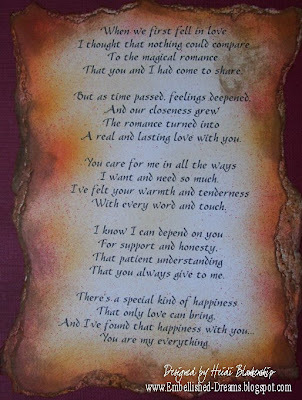 The Font set is also from Spellbinders and it is called Mystic. The word GIRLS was done using metal embellishments. Also if you click of the images to enlarge you will see more detail and you might notice that the lace is glittery. To do this it is best to work on wax paper, I applied a glue adhesive to the lace, move to a clean piece of wax paper and then added the glitter. 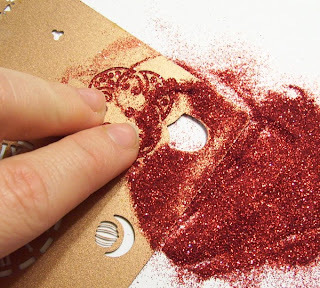 Carefully tap off the excess glitter and lay flat to dry on the wax paper. If I can go back to the flowers for a moment, I cut out several flower pieces and then used the Copic ABS and markers to add the color to the flowers. I stacked them using foam tape and then added stickles to each flower. The picture were also altered on the computer using Adobe Photoshop Elements. The pictures were originally in color. I changed them into B & W and then I added the blue color to the dress. 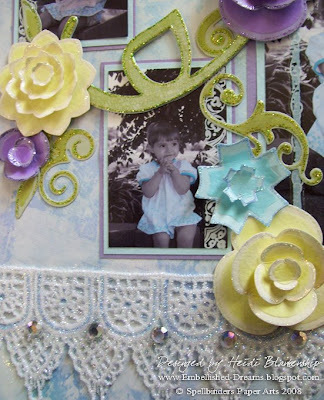 The flourishes, flowers and lace trim on the photos are rub-ons from Fancy Pants and they were applied using the Wizard, yet another get technique that can be achieved with the Wizard! 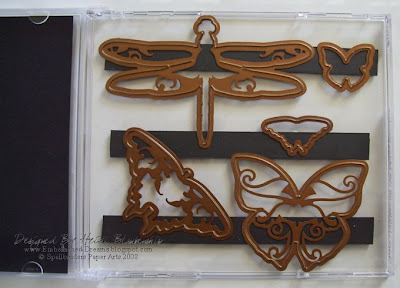 If you would like to see more designs using Spellbinders products check out the Spellbinders Gallery---->HERE. 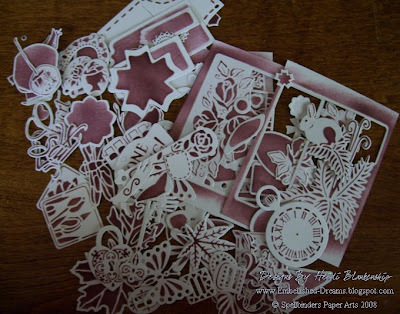 All of the wonderful ladies from the Spellbinders DT have have been working on projects so if you have a little time please check out the gallery to see many more beautiful designs!! Also while you are there don't forget to check out Our Design Team and get to know a little about each of us from our bios. Thank you so much for stopping by and I hope you are having a WONDERFUL week! !